Our friends at Dormeo are offering our readers the chance to win an autumn/winter bedding bundle. Ieva Baradouska is the company's Comfort Expert. Here, she shares her top tips for transforming your bedroom into a sanctuary where you can enjoy plenty of high-quality sleep. Fortunately, there are a range of things you can do to help yourself get a good night's sleep, and turning your bedroom into a peaceful haven is one of them. Here, I'm going to take you through just some of the ways you can transform your space into the perfect environment where you can enjoy night after night of restful sleep. Read on to learn more. Not only can clearing your bedroom of clutter help you to fall asleep more easily, but it can also improve the quality of your sleep. So, if you're often restless at night, or don't feel particularly rejuvenated when you wake up in the morning, tidying your space could be a great place to start. Throw away, sell, or donate anything that you no longer use or need, and invest in some new storage solutions where you can hide everything you do want to keep. This will help you to keep your bedroom much tidier, so it will become somewhere that you always feel peaceful. Many of us will spend time scrolling through social media before going to bed, or even while our heads are on our pillows. But, the blue light our devices' screens emit can make it much harder for us to nod off, and even reduce the quality of our sleep. If you truly want to create a space where you can get the best night's sleep possible, it's a good idea to make your bedroom a device-free space. If you currently use your mobile phone as an alarm clock, buying a more traditional clock will help to make the transition much easier. And, if you usually track your sleep, using a different — preferably screenless — accessory, will help to prevent you from relying on your phone so much at night. As a general rule, the darker your bedroom is, the better night's sleep you're going to get. If you want to be able to fall asleep much more easily or improve the quality of the sleep you do get, it's wise to block out as much light as possible. Arguably, the easiest way to do this is with some blackout blinds or a set of blackout curtains. 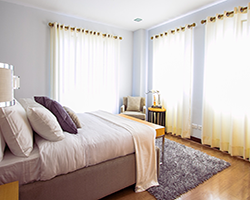 It's common for people to persevere with curtains or blinds that aren't particularly effective at blocking out light because they like the look. If you want to improve the effectiveness of your drapes without having to sacrifice the design of your room, you can buy readymade blackout linings that you can attach to your existing curtains to make them much more functional. Sleeping on a mattress or with bedding that's past its best can severely reduce the quality of your sleep. If you regularly wake up tired even though you've gotten what should be plenty of sleep, it could be time to assess whether your bed could be to blame. Your pillows should do a good job of keeping your neck comfortably aligned, but they'll become less effective as time goes on. If you regularly wake up sore or stiff, try to remember when you last bought a new set of pillows, they should be replaced every two to three years. Additionally, it's vital that your mattress supports your body properly. Memory foam models are ideal for this, as they shape perfectly to your body, ensuring you're as comfortable as possible. Many manufacturers recommend replacing your mattress every seven to 10 years so, if yours is no longer at its best, swapping it for an innovative memory foam mattress could be the best thing you ever do. 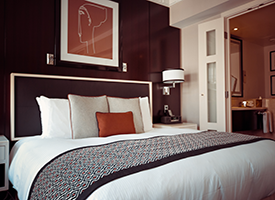 Making some small changes to your bedroom can make a huge difference to your quality of sleep. Take these tips on board and you should find it much easier to nod off each night. Plus, you'll be far more likely to wake up rejuvenated and ready to take on the day. Reeds Rains has teamed up with our friends at Dormeo to offer the chance for you to win their autumn/winter bedding bundle. Dormeo also wants to welcome you to their warm and cosy world with an exclusive 10% discount on orders over £200 at Dormeo.co.uk using the code REEDSRAINS10 (not applicable to clearance items). Simply enter the code at checkout to get some new bedding, a mattress, or both for less.